It’s Monday and everyone’s dreaming about Friday. I hadn’t even made it through ten minutes of the workday and people were already moaning about the weekend being over, how much they can’t wait for vacation, how tired they are, how much they hate Mondays. Don’t get me wrong, I was right there with them. This morning my alarm clock and I were far from friends. I managed to get through the day. I whined occasionally about how I didn’t feel good, raced through to get as much work done as I possibly could and then got out of there as soon as I possibly could. And then I saw a note that an old friend wrote about her day. She wrote about the kindness of others, the kindness she experienced while running errands with her father who has Parkinson’s. She wrote about the gentle greeting of the woman at the dry cleaner who hugged her dad upon his arrival and departure and about the man who sang a Christmas carol while helping her dad walk and about the many people who waited with patience as she and her dad slowly made their way through doors. Her note made me reflect on my own day, the day I had wished away. The little girl bogged down with a huge backpack and giant saxophone case who rushed to hold the door open for me this morning. The excitement in the eyes of one of my kids who got her first college acceptance in the mail. The cup of hot tea my mom joined me for after a long day at work. The old man who waved me in to merge with traffic even though everyone behind him was honking. 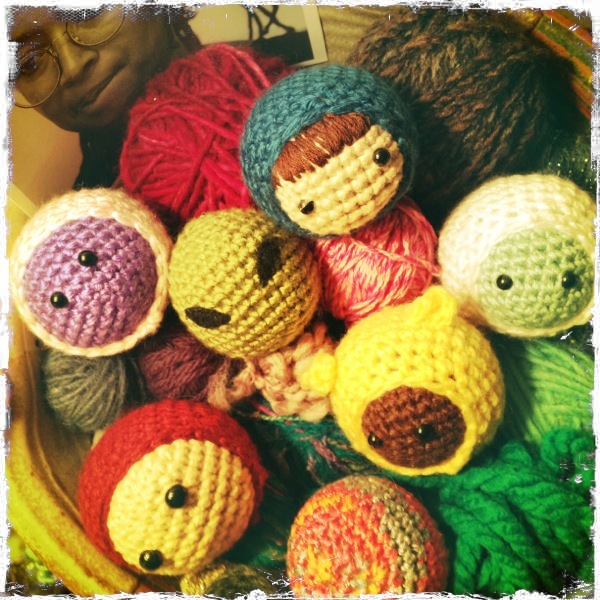 The texts with Kate about the amazing bowl full of heads that she crocheted for me. The memory of my friend’s dad playing the drums with wild abandon in his pajamas in their front hallway. Thank you to my old friend and her jackdaddy for reminding me that today is more important than tomorrow. My Monday wasn’t much, but it sure had it’s beautiful moments. Previous more clapping, more growth! Next shine on, john travolta! Susan! Thanks for sharing. Greg is a rockstar and so are you. It’s been said that today is a gift and tomorrow but a promise…how nice that your friend reminded you, and you reminded me. Thanks for joining me in that cup of tea. It’s the littlest things that make our days special, isn’t it? I was laying in the dentist’s chair this afternoon, having one of my snaggly, McGlaggly tooth filled today (lower right central incisor) and in awe of the dentist and his assistant; it was a dance, a ballet they were dancing over my wad-stuffed maw. No words, that I could hear, but they were so GOOD at what and how they did it. They were taking care of me. The world is there. When we invite it in; when we reach out to it; when we just simply live, it is a wonder. UP, I have a couple of those McSnaggly’s too… genetics, doh! I love that you found the beauty, the art in something that most people dread. Goodness is everywhere. Love you. Thanks for the reminder that a shift in perspective can make a world of difference. Thanks for reminding me that a moment with a good friend is the best kind of medicine, girl. Such a beautiful and inportant post. Love it. Thank you. I love the picture! You once wrote to me, “… if you look and want to see, there are secrets in the world and much love in it.” Truth. Truth. Truth. Today you were a bright spot in my day, Susannah! You were a bright spot in my day, too, Denise! You always are. Thanks for reading! I’d love your feedback. This was the perfect punctuation to a Dad/Daughter evening w/HPHS benefits. UBUNTU is alive and well in Hartford! YES! Dad, I always love hanging with you. And running into the HPHS old-time crew was an added treat. Thanks for making time to chill with me. I love you. Most amazing insight there!!!! SO TRUE. Like Susan said….kindness from random people humbles me! Kat! You are the random kindness fairy! Thanks for the love. It’s coming right back at you. The present is a gift. That’s why they call it the present. You got that right! It’s so easy to forget that. I hope your day has been full of little gifts. dang sue. for real?? what a great post. brought me a couple places: to the chatfield’s foyer, where you never knew what you would walk into and you always secretly hoped it would be to jackdaddy banging on the drums in his jammies… and more importantly, to the here and now.